Meinders School of Business is pleased to honor Maxim Sytch as our 2017 Distinguished Alumni. 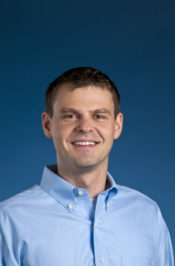 Maxim Sytch is an Associate Professor and a Michael R. and Mary Kay Hallman Fellow in the Department of Management and Organizations, Stephen M. Ross School of Business, University of Michigan. He is a Research Director of the Sanger Leadership Center and a Faculty Director of the Strategic Leaders Program at Michigan Ross. Previously, he was a lecturer in the Department of Management and Organizations, Kellogg School of Management, Northwestern University. Selected as one the 40 Best Business Professors under 40 in the World by Poets & Quants in 2014, Maxim Sytch is an expert on leadership and organizational issues within firms. His research focuses on how networks of collaboration and conflict within and between firms affect individual and firm outcomes. He examines how leaders can manage and leverage connectivity within and across organizational boundaries to enhance performance. Maxim Sytch has been published in leading journals such as Academy of Management Journal, Administrative Science Quarterly, California Law Review, California Management Review, Managerial and Decision Economics, Organization Science, Sloan Management Review, and The Wall Street Journal. His work has also been covered by AsiaOne.com, BusinessWeek, The Brunei Times, Harvard Business Review Online, Phys.org, Reuters, and Yahoo! News. In 2016, his paper on social structures interconnecting lawyers and federal judges in litigation was the finalist for the Best Paper on Entrepreneurship Award from the Organization and Management Theory Division of the Academy of Management. In 2012, another study, which examined the relationship between network communities and firms’ invention productivity, was a finalist for the Best Paper Award at the Israel Strategy Conference. In 2010, his study examining dynamics of influence in patent infringement litigation won the Best Paper Award from the Organization and Management Theory Division of the Academy of Management. In 2009–2010, Maxim Sytch moderated an online Leadership Seminar in collaboration with the Washington Post. He is a member of the Academy of Management, the American Sociological Association, and the Strategic Management Society and serves on the Editorial Boards of Academy of Management Journal, Administrative Science Quarterly, Organization Science, and Strategic Management Journal. He won Outstanding Reviewer Awards from the Academy of Management Journal and Organization Science in 2014 and 2015, respectively. In 2014, Maxim Sytch won the Ross Executive Education Teaching Impact Award for open enrollment programs. His online specialization on Leading People and Teams (coursera.org), launched in 2015, is the leading online leadership course in the world reaching more than 150,000 students. He also advises and speaks to corporations worldwide. Some of his recent engagements include clients such as Bank of America, Bank Mandiri, Banque Saudi Fransi, Bosch, Chicago Public Schools, Chrysler-Fiat, Grainger, ICBC, Masco, Morgan Stanley, M&T Bank, NextGen, Novartis, Oracle, Qualcomm, Ronald McDonald House Charities, Schneider Electric, and TRW. Prior to entering academia, Maxim Sytch worked in the financial sector for Merrill Lynch and the Central Bank of the Russian Federation. He holds a PhD from the Kellogg School of Management, Northwestern University.